Not having flu, again, lar. I'm back, sniffing the air of Kota Kemuning, afer 2 months! Wohoo! Even though, ahha, it is relatively poluted compared to Changloon, but still, it is my home sweeeeeeet home. yada yada. The list is never-ending. Hehee. Everyone was in an extreme mood of excitement yesterday. Hui Yi went back before us, so we decided to bid farewell to her before she left. 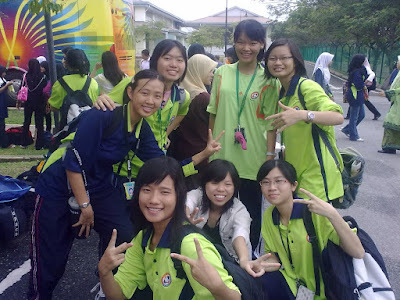 Back (left): Ying Sze, Hui Yi, Xuan Ling (Cindy), Ee Jye (EJ). Front (left): Jasmin, me (squatting as if i'm doing my business LOL), Adeline. Said "bye bye" as if we are not gonna see each other forever, when the fact is, i might just bumped into her when i am doing my shopping in Klang! LOL! That, will be really funny. Not forgetting Azfa, the bubbly little girl who is going back to Ipoh. If i have not mention this before, she is actually an ex-schoolmate of Yasmin in Convent Ipoh! Such a coincidence. By the way, these are the three noise-makers of H1P7. From the left: Azfa, Yours Truly and Eeeeeeeee Jaaaa-eeeeeeee (EJ). Hugged every each of them before we are parted. We are just gonna make that same sad face together when we are back to KMK. Haha. Oh wait, i can wait for the last one. Somehow, bringing one bagload of books back to home = make yourself feel less guilty. Heeee. to all the matrics students!